Torrent downloads remain a popular way to quickly download files from the Internet. Unfortunately, most Internet service providers (ISPs) throttle Internet speeds and occasionally send a notice warning you to stop downloading media. Usenet is here to save the day. In this Usenet guide, you will learn what is Usenet and see a Usenet vs torrents comparison. So without further ado, let's get right to it. Usenet vs Torrents? Is Usenet better than torrents? What are Usenet Providers? How do I choose one? Wikipedia tells us that Usenet is a worldwide distributed discussion system available on computers. It was developed by Tom Truscott and Jim Ellis in 1980, over 10 years before the World Wide Web (or the Internet) was developed and the general public received access. So, when asking “What is Usenet?” we can safely say that it is the precursor to the Internet forums used today. That's because it was designed as a place to participate in discussions and post messages. You are probably asking: “Why are we even talking about Usenet if it's that old?” Well, Usenet is one of the oldest computer network communication systems that is still in use today, but the original use has been changed, turning Usenet into a place where users are anonymously sharing files. Before we start comparing Usenet vs torrents, it's worth to show the difference in popularity between them. By performing a simple Google Trends search, we can observe that in the last 5 years, the interest for torrents has been higher than the interest for Usenet. Usenet interest witnessed a big spike at the end of 2012. But after that, interest steadily decreased. Even if the interest for Usenet is not as high as for torrents, I am sure that it will start to go up soon because of multiple reasons exemplified below. With Usenet, you directly connect to the server to access the available files for download. Plus, you download the files directly from the server. However, when using torrents you download multiple pieces from multiple peers. The Usenet server has an almost 100% uptime. Whereas if you use torrents, you are limited by the number of seeds and their availability. If the seeds are not active, you will not be able to download the files. The connection to a Usenet server is encrypted by using SSL. That's a cryptographic protocol that provides communications security over a computer network. Therefore, your Internet service provider will not be able to detect the files you are downloading, thus protecting you from getting notices. The torrent connection is not encrypted. So your ISP can easily detect the type of download as being a peer-to-peer connection. As such, you're more prone to receive notices from them. But you can protect yourself from prying eyes while torrenting by using a VPN service like IPVanish. The VPN service will encrypt the connection, offering a higher degree of protection when downloading files while using torrents. You can check our article on how to protect yourself using a VPN service to learn more about VPNs. In order to connect to a Usenet server, you need to subscribe to a Usenet service. This usually requires a monthly/yearly fee. Although free alternatives exist, I would not recommend even trying them out because the amount of available files is limited. My favorite Usenet provider is Newshosting which offers unlimited data transfers for less than 16$/month. Torrent access is free for the most part. But when using a free torrent tracker the transfer speeds are low. Besides that, if you manage to get access on a private tracker, you need to seed your files and build up a ratio, which can be time and resource consuming. Usenet servers usually offer speeds ranging from 1Gbps to 10Gbps, so you will probably be limited by the speeds offered by your internet service provider. When using torrents, you can saturate your internet speed, but only if you use a private tracker with good seeders. When using a public tracker, the download speeds are usually mediocre because of fewer seeders. This means that if there are not enough seeders, the speeds will be slow, while on Usenet, the speeds are usually constant and fast. If you have a good Internet connection speed, you should direct your attention to Usenet. When downloading files from Usenet, you may encounter content that has been previously compressed into an archive. For example, a video file is usually compressed into multiple small archives to improve download speeds. The Usenet client will automatically unrar the video file, preparing it for your consumption. On the torrent side, you will usually get the video file directly, without it being into an archive. There are a lot of times when content from Usenet gets to the torrent trackers and the content is untouched, with the video file split into multiple archives without it being unarchived in advance. This can be a problem for automated download scenarios because most of the torrent clients are not automatically unarchiving the content. There are some ways to automate the unrar process, so if you want to learn more about this, make sure you check our article on how to automatically extract RAR files after download. On Usenet, all the files available for download are stored on Usenet servers, in a central location while on torrents, the files are distributed on multiple servers and computers. While having all the files on a single location offer great speeds, it also means that the Usenet servers have a limited availability because of limited storage space. 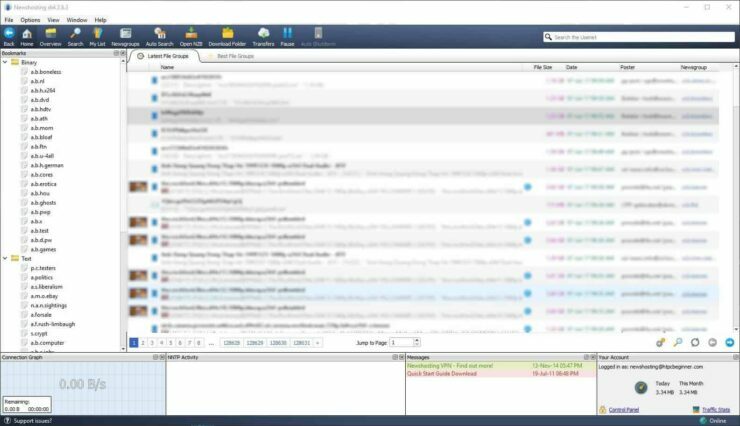 In the Usenet world, this is called retention, and when looking for a good Usenet provider you should look for one with a long retention time if you need access to older files. On the other hand, files available as torrents are limited only by the space available to the users, and their willingness to seed those files. This means that if you are looking for some rare file, you will have a better chance to find it on torrents rather than Usenet. In order to have a complete Usenet guide and answer the question “What is Usenet” while doing a good comparison for Usenet vs torrents, we need to learn about Usenet providers. Maintaining the comparison for Usenet vs torrens, we can say that the Usenet providers are really similar to Torrent trackers. The Usenet provider gives you access to a server with content ready to download, which is similar to torrent trackers, but there are some differences between them. When using torrents, you are downloading a .torrent file that points to the file you want to download. The same happens on Usenet, where you download a .nzb file. While the .nzb file points directly to the Usenet Server, the .torrent file only points to the tracker, then the client looks for seeds from where to download the files. When choosing a Usenet provider, probably the most important aspect is the traffic included in the subscription. This is the amount of data you are allowed to download from the Usenet Server. Some Usenet providers have data caps (ex: you are allowed to download 10GB/month). Other providers offer unlimited data transfers which means that you can download as much as you want without having to limit your consumption. As previously mentioned, Usenet servers usually have limited storage capabilities, meaning that files need to be periodically deleted in order to add new files. Retention is the number of days for the files to be available on the server. Newshosting is offering 3248 days of retention which should be more than enough for most users. Another important aspect in our Usenet guide on choosing a Usenet provider is simultaneous connections. This is important for the speed you are downloading the files from the server. Usually, files are split into multiple smaller files which are downloading at the same time to improve download speed. Each part of this file uses one of your available connections, so for example, if your Usenet Provider allows 30 simultaneous connections, you can download a file split into 30 parts at maximum speed. Please note that if you don't have a good Internet connection, this aspect may not be that important in your case. Also, if you have a fast internet connection, you will need a fast drive that is able to keep up with the amount of data downloaded at the same time (ex: an SSD). While most of the Usenet providers offer secured connection with SSL encryption, there are other cheap providers that are not securing your connection to the Usenet server. Because of this, you will be required to use a VPN connection to secure your traffic from your internet service provider which will add additional costs. To avoid this, make sure you choose a Usenet Provider with SSL encryption to save yourself from spending more money and to keep your privacy. 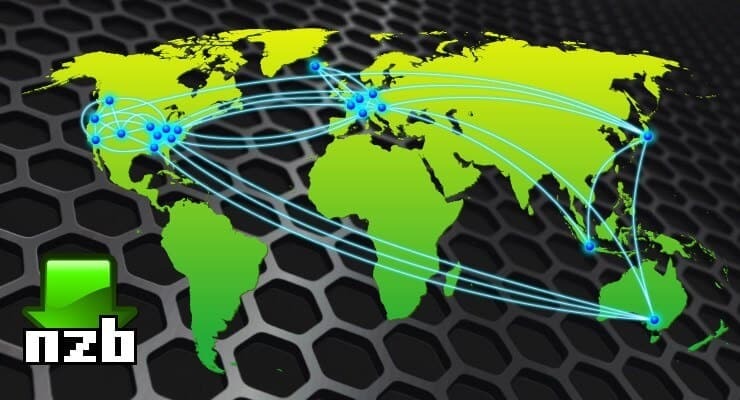 For users with good Internet speeds, the server location is another important aspect to consider when choosing a Usenet provider. It is important to choose a Usenet provider that has server farms in your region. For example, it's not the best idea to choose a provider that has servers in the US while you are located in Europe because the speeds will be lower. Providers like Newshosting offer a free VPN service included in the monthly subscription for Usenet access. If you want to protect yourself from traffic interception, you will want to use a VPN even if you are not downloading files, and only browse the internet. This aspect can help you make a better decision when comparing different plans offering different benefits. You may pay a bit more for a more expensive plan for Usenet, but if you are already planning to also subscribe to a VPN service, then it's probably cheaper to only buy the top plan from the Usenet Provider. After signing up with one of the above Usenet service providers, yo uare ready to starting using Usenet to download files. In this Usenet guide, I will show you how to use Newshosting Usenet provider. 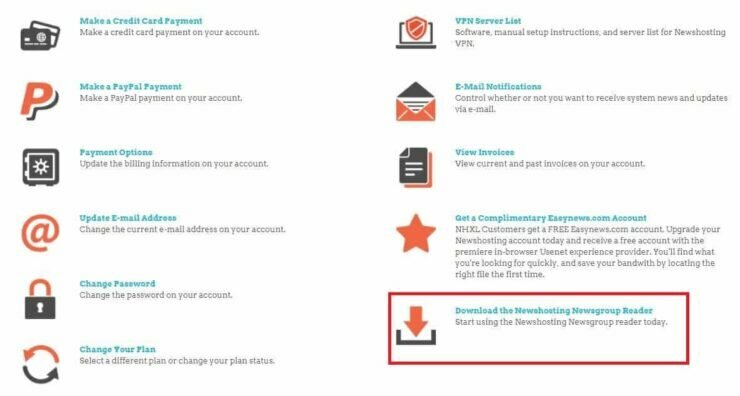 Login to your Newshosting account and download the Newsreader. Select the appropriate operating system to start the download. In my case, I chose Windows. 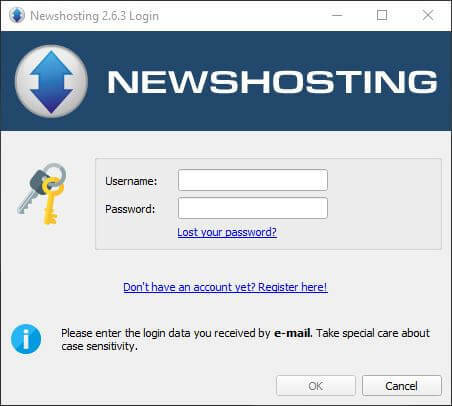 After installing the newsreader, log in using your Newshosting credentials. Usenet is now available and you can start downloading files. Despite the massive popularity of torrenting, Usenet provides many benefits over torrenting. Primarily, this derives from security, file processing, and encryption. However, file availability tends to be better with torrents. Ultimately, when comparing Usenet vs torrents, you'll find that both offer excellent options. Especially when using automation software such as CouchPotato, SickRage, Sick Beard, and htpcBeginner's own AtoMiC Toolkit, a combination of torrents and Usenet yields best results. Your turn: what Usenet downloaders and services do you recommend?